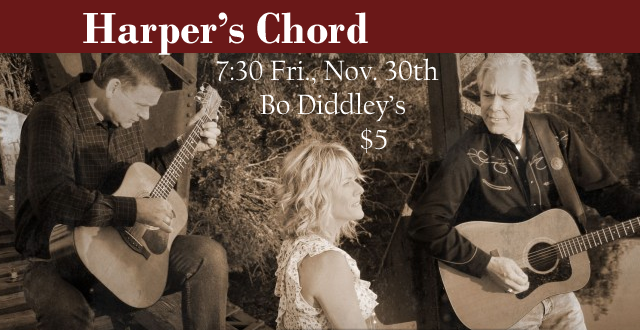 Last year, a trio of veteran central Minnesota musicians—singer Jill Moore and guitarists Paul Drinkwine and Roger Fink—came together to form Harper’s Chord. We hosted a celebratory concert for their initial CD, “Natural Bridge,” in March and are happy to welcome them back to Bo Diddley’s for another evening of country-folk-grassroots-Americana. Seating is assigned according to ticket purchase date for shows at Bo Diddley’s. Requests taken.